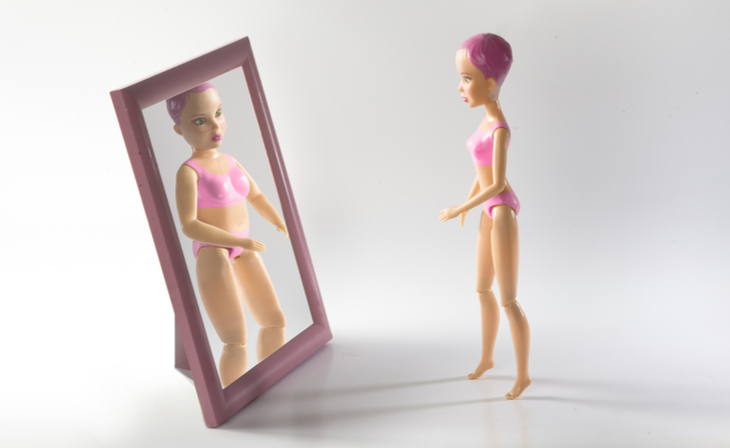 According to the Anxiety and Depression Association of America, Body Dysmorphic Disorder (BDD or simply body dysmorphia) is a body-image disorder characterized by persistent and intrusive preoccupations with an imagined or slight defect in one’s appearance. The disorder frequently comes along with eating disorders like anorexia or bulimia, however, an individual may experience body dysmorphia without having a co-occurring food-related disorder. I have dealt with body dysmorphia for about 17 years now. Funny thing is, I beat bulimia about six years ago. Beating bulimia is a story for a different day, but I never managed to shake the dysmorphia. You see, I don’t know how all of that works in the brain. Ya know, medically and clinically speaking. Alarm goes off. It’s time to wake up. That means getting dressed; dressed for the day. If I choose a shirt or a dress that shows too much armpit fat — I’ll focus on it all day long. If I feel my shirt touching the skin on my belly — my brain will think that I’m completely stuffed and I’ll completely lose my appetite. Don’t forget,I beat bulimia. Unfortunately, I wasn’t aware that I would never be able to look at my body the same way again. After about 17 trips to the mirror, I finally decide on the 2XL shirt for my ‘average’ size that I can wear off the shoulder with some leggings that will hide any sight of perceived muffin-top. The only way I can tell if I’ve lost or gained weight is by keeping clothes of all sizes at all times in my closet so I can see how they fit me. I’m strong enough to get on a scale, but I don’t trust them. It currently says that I weigh the same amount as my mother-in-law but I know for a fact that it’s impossible, yet the scale at the doctor’s office says the same thing. I can only trust my clothes. I know how certain clothes fit me when I was at my ideal weight, so that’s how I judge. The rest of my day is spent avoiding reflective surfaces. No glass storefronts, please. I don’t need a glimpse of something that is going to consume my thoughts for the rest of my foreseeable future. I don’t necessarily understand why the dysmorphia continues to linger on. It might be something that I have to cope with my entire life. Overcoming an eating disorder is almost harder than getting off of drugs, at least from my experience. I may still have some side effects that I’m trying to manage, but it’s difficult to handle on your own. If any of this story strikes a chord with you, you could be suffering from a certain level of body dysmorphia. Little known fact: Approximately 1 in 50 individuals meets the criteria for BDD. You’re not as alone as you may think. The educated, experienced staff at Adolescent Growth is available at all times to assist you in deciding if you need help or treatment with this mental disorder, whether if it’s for yourself or a loved one. Call us now at 1-877-588-9668. You don’t have to go through this alone.